Acrylic, PETG, PS, PP, PC, MS, ABS, PVC, TRITAN, AS and PE, etc. 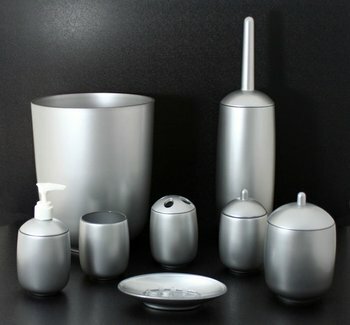 Toilet brush/Waste Basket/Soap Dish/Tumbler/Toothbrush Holder/Lotion Dispenser/Two Holders. We, at Dalco, is your one stop solution for all your plastic requirements. If you need Plastic Houseware, Plastic Store Display Fixtures, Plastic OEM works, Plastic ODM works, Dalco will be your strongest support. Taitra, Gold supplier of Alibaba, member of Global Sources and member of North American Importers Association. 1) Houseware - including Bathroom accessory, Kitchenware, Tableware, Barware, Living room utensil and Storage organizer, etc. Mirrors, Showcase, Sigh holders, etc. We also do ODM/OEM manufacturing tailor to your specific needs. We can do Fabrication, Injection, Extrusion and Vacuum forming works, CNC work cell and Laser cutting works to cooperate with your manufacturing plans. We have our own Molding Department. Your product will already be in the best situation when it’s still in tooling design phase in Dalco’s hands. We are able to work with many kinds of chemical materials such as Acrylic, PETG, PS, PP, PC, MS, ABS, PVC, TRITAN, AS and PE, etc. If you could not find the products that you need on our website, please let us know. It will be our pleasure to quote for you if you could send us drawings or samples. Our talented and experienced staff is available to work with you on any existing or planned future projects. Please let us know if there are any questions. We look forward to the opportunity to work with you in the near future.